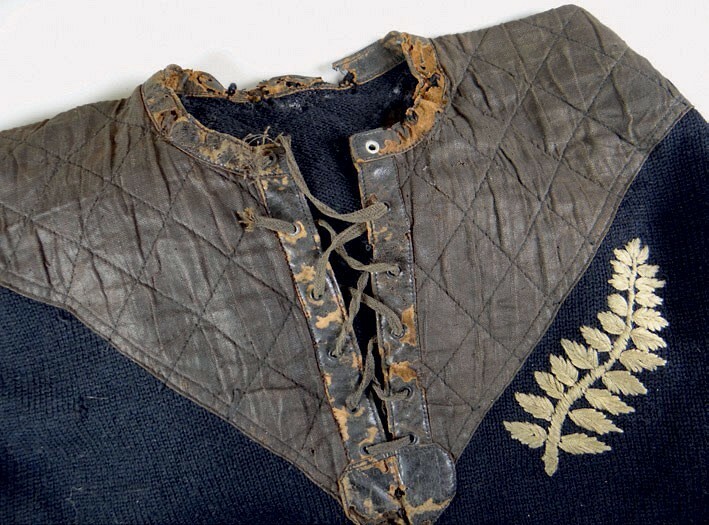 This 1905 All Blacks shirt worn during the first Rugby Union test match to be held in New Zealand between the All Blacks and Australia is estimated at £30,000-40,000 in Rogers Jones’ auction on March 1. This 1905 All Blacks shirt was worn during the first Rugby Union test match to be held in New Zealand between the All Blacks and Australia. The hosts won 14-3. The wearer was full-back Hubert Sydney ‘Jum’ Turtill (1880-1918). Described as one of the great pioneers of the position, he brought attacking instinct when it was traditionally considered exclusively a defensive role. Turtill only received one cap for the All Blacks before switching to play rugby league for the NZ team dubbed ‘All Golds’. Born in London but raised in Christchurch, Turtill later returned to Britain and played for St Helens rugby league club. He was killed in action in France during the First World War. The shirt comes with associated items including Turtill’s All Blacks cap. The lot is estimated at £30,000-40,000 at Rogers Jones in Cardiff on March 1.